Dr. Bill Jones is congratulated by Brig. Gen. Leon Lott. In a unique Chapel service at Columbia International University, South Carolina State Guard Commander Brig. 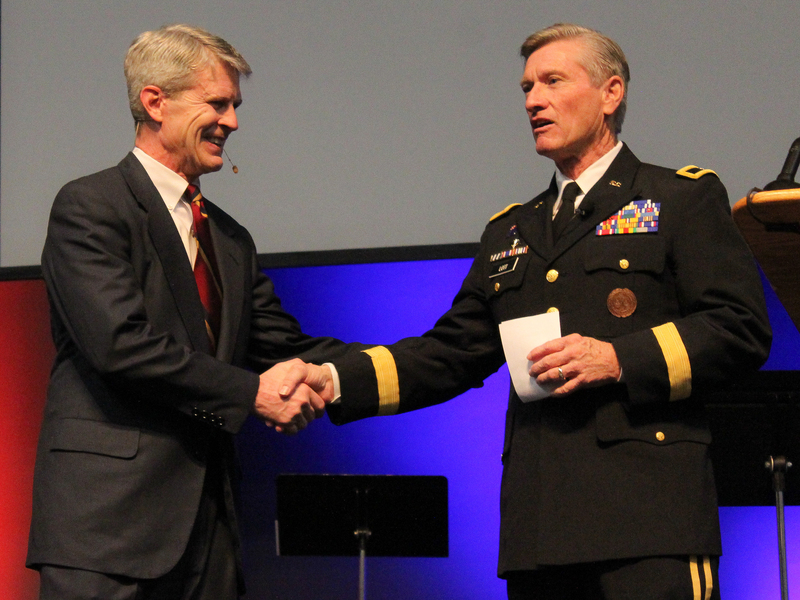 Gen. Leon Lott swore in a new recruit: Dr. Bill Jones. Jones is the chancellor of CIU. Lott also serves as Richland County Sheriff. The ceremony included the presentation of new CIU bachelor’s and master’s degrees in Disaster Relief and Emergency Management coming in the fall semester of 2019. The degrees fit with the mission of the S.C. State Guard “to quickly respond to protect people and property and to help communities recover” during a natural or man-made disaster in South Carolina. Watch the swearing-in ceremony as Jones’ wife Debby holds the Bible and their granddaughter Aubreye Jones looks on. Dr. Bill Jones served as the sixth president of CIU from 2007-2017 and has since served as chancellor. Additionally, he serves as president of Crossover Global, an organization he cofounded in 1987. Crossover Global works to plant churches around the world. A passionate communicator, Jones has spoken to thousands of people across the globe and has authored several books. The State Guard is part of the South Carolina Military Department under the direction of the Adjutant General. Its Commander in Chief is the Governor of the State of South Carolina.